I recently had one of our reviewers, Jason, try out a pair of Zeko Shoes. These shoes are lightweight with a vented sole and weigh only 5.6 ounces. The EVA Sole absorbs shock, which makes you feel like you’re walking on a cushion. I’ve owned a pair for 3 years and the Velcro on top has yet to wear. The shoes help to alleviate soreness in my knees when walking moderate distances on asphalt, or while wearing them outside and doing chores around the house. Cleaning the shoes is easy – all I need to do is pop them in the washing machine and hang them to dry. 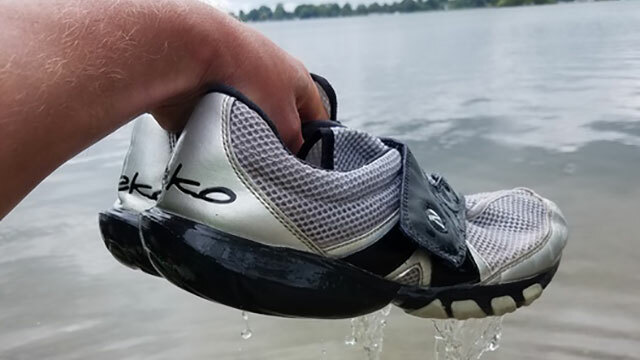 Jason found that even after a month of wearing his Zeko Shoes out in the kayak and in the water, they did not seem to have any odor. Zeko Shoes are a shoe for the summer months to utilize while camping, kayaking and fishing. Jason even noticed that when he jumped into the open water, he could swim very easily with them on. He also liked the fact that you can take out the insoles. Another nice feature is the screen embedded in the bottom of the shoe, which allows water to travel through but prevents rocks and sharp objects from getting through. This element also allows for quick drainage, permitting quick drying time and keeping your feet from getting water logged. One dislike Jason found was that the toe of the shoe was missing protection. 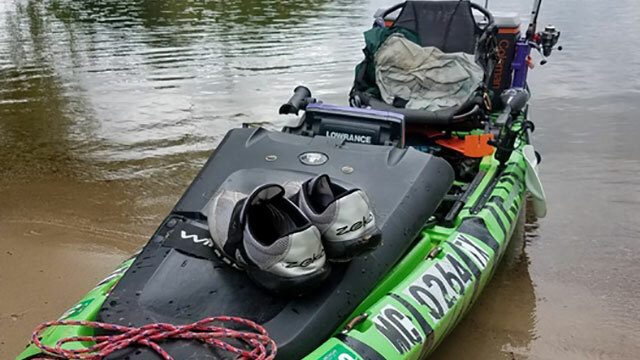 Another of his dislikes included the traction on the bottom – although very nice in the water, he found the Zeko Shoes to be a little slick on his kayak or any kind of surface that is shiny or wet. All in all, Jason felt the shoes were very nice, and he is looking forward to wearing them for the rest of the summer. He felt they were by far the best water shoe he has tried to-date. He also appreciated the fact that the shoes are so light that it's almost as if you don't even have shoes on. As for me, these shoes fit well and are extremely comfortable wherever you decide to wear them. I would not recommend these for hiking because of the lack of support. Besides this shoe, Zeko makes a sandal called the SlidZ, which is also available in a multitude of colors. For more information on Zeko Shoes, visit ZekoShoes.com. Review written by Gary Elliott, facilitator of https://www.facebook.com/GarysOutdoorNewsandReviews and @garys_outdoor_news_and_reviews.